The Senate President Dr Bukola have denied his association with the criminals who claimed they are his political thugs in their confession statement. Saraki in a press statement through his Special aides on Media and publicity Yusuph Olaniyonu described the allegation as baseless and another ploy to implicate him by the police. "Let it be known that there is no way I could have been associated with armed robbery against my people. When the Offa robbery incident happened, I was the first top public official to pay a visit to the place and right there in the palace of the traditional ruler, I put a call through to this same Mr. Ibrahim Idris, the IGP, requesting him to make certain specific security arrangements as demanded by the people. "Members of the public will remember that on May 16, 2018, I alerted the Senate about the information passed on to me by my State Governor, Dr. Abdulfatai Ahmed, over a plot by the Inspector General of Police, Mr. Ibrahim Idris, to frame me up by getting some suspected cultists arrested in Ilorin to implicate me. It is believed that the timely leakage of the plot in that case aborted the use of the suspected cultists to implicate me. Now, it is the Offa bank robbery suspects that are about to be used. "This plot is concocted to embarrass me and, in the mind of the IGP, it is his own response after his refusal to honour the invitation by the National Assembly, headed me, for him to come and offer explanations on the rampant killings and violence across the country. "Like the earlier one, this frame-up will also fail as I hereby state categorically that I have no link with any band of criminals. "As a person who has utmost respect for the rule of law and all constitutional institutions, when the invitation from the Police is formally extended to me, I will be ready to honour it without any delay. 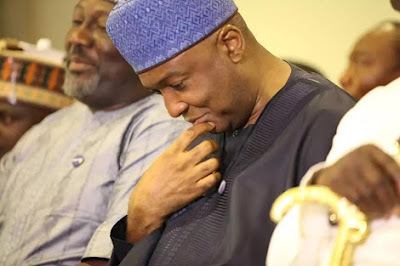 "It is however sad that this abuse of the criminal investigation process aimed at intimidating and over-overawing the legislature, thereby obstructing it from doing its work, is a big threat to our democracy ", the Senate President stated.